Your smile is an important asset. It shares your personality with the world. Smiles can denote confidence, welcome, joy, and friendliness. A vibrant and healthy smile has the ability to enhance your professional and personal life. 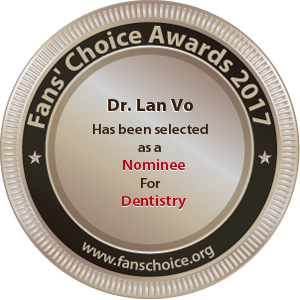 Dr. Lan Vo and Dr. Sean Breckley at 32 Dental in Kennesaw, GA, enjoy helping each patient achieve his or her optimal smile. Having both earned their Doctor of Dental Medicine degrees from Temple University School of Dentistry, Drs. Vo and Breckley provide a host of cosmetic options to enhance patients’ smiles, including professional teeth whitening. Often the quickest and most inexpensive way to brighten a smile, our teeth whitening system allows patients to brighten their teeth in the comfort of their own homes. An impression is taken of the patient’s upper and lower teeth and is used to create custom tray. A safe and effective whitening gel is placed into the tray. Patients may use the whitening system at their leisure for an immediate impact or for future maintenance. Patients should avoid staining agents for a while after teeth whitening and should continue to follow a healthy oral hygiene routine between regularly scheduled professional cleanings and examinations. Drs. Vo and Breckley offer patients a complete range of dental care including treatment and prevention of gum disease, extractions, root canal, and cosmetic dentistry. If you are ready to take the first steps to a healthier, happier smile and enhanced oral health, our doctors and staff are here for all of your unique dental care needs. Our practice is located at 600 Chastain Road NW, Suite 422, Kennesaw, GA 30144. Appointments may be scheduled online or by calling (770) 423-1132.